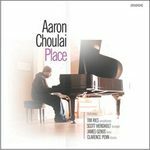 Pianist Aaron Choulai describes the recording of Place: "Most of the music was written specifically for this album. At the time New York was in the forefront of my mind and I guess subconsciously I was trying to recreate an impression of the New York jazz tradition. "It is quite different from anything I have written before and is what New York sounds like to a 20 year old Papuan, Chinese, Jewish Australian who had never been there at the time. Tim, Scott, Clarence and James, who are very much the 'real deal' and have lived and worked in New York most of their lives, interpreted the music in a way which brought it to life for me, and in a way which I doubt many musicians could." What makes this album special is their interpretation of a music which is an interpretation of their city and their history, a combination of reality and fantasy. Aaron has just signed a three-record deal with Sunnyside Records in the US and is also recording for Move in Melboune. He was recently joined by New York saxophonist Tim Ries (who is featured on Place) at the Melbourne International Jazz Festival. Tim met Choulai while touring Australia last year with the Rolling Stones. Tim's band features some heavyweight US jazz players, including Billy Drummond and Ben Monder. They will perform Ries's arrangements of Stones tunes as well as a set of Choulai originals.